This tutorial is for raw printers only. If unsure please see What is Raw Printing? These steps will allow a USB, Network, Serial or Parallel attached printer to receive raw commands through Java on Windows. Note: This tutorial also applies to Windows XP, Vista, Windows 8, and Windows 10, but some steps will differ slightly. Open Control Panel > View Devices and Printers > Add Printer. 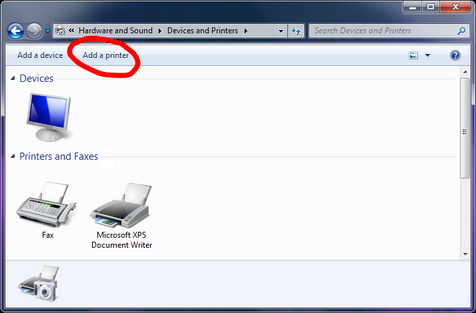 Note: On Windows 8 use "Advanced Printer Setup"
Click "Add a local printer." Ignore the USB message. Click Create New Port > Standard TCP/IP Port > Next. Enter the IP address and uncheck "Query the Printer..."
DO NOT click "Add a Wireless, Bluetooth or Network Printer." Always use the local port option for Network Printers. Click Use Existing Port. Then, Select the appropriate COM or LPT port. Click Use Existing Port. Find the matching USB00x port that was installed with the device driver. If unsure of the port, cancel the Wizard. Right Click the USB Printer > Printer Properties > Port. (Reminder: In Windows 7, it's called "Printer Properties, not "Properties"). Note: For USB to operate properly, the device driver should already be installed. This is automatic in Windows 7 when connected to the internet. Windows XP may need a device driver installed manually. Download from manufacturer if needed. 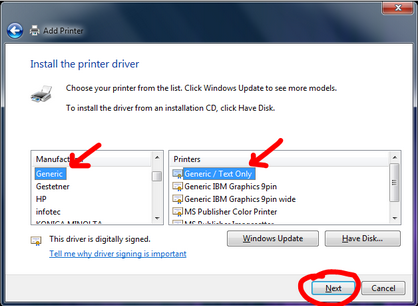 For printer driver, select Generic > Generic/Text Only > Next. Note: Some print drivers, such as Zebra ZDesigner or CUPS Zebra driver have dual-mode drivers capable of accepting Raw commands as well as PostScript commands. If Raw printing works with the vendor supplied driver, chose that over the Generic/Raw driver. If prompted to replace the current drive, click "Replace the Current Driver." Name the printer (ie. "zebra") > Next. Uncheck "Set as Default Printer" Recommended as to not override default printer settings.